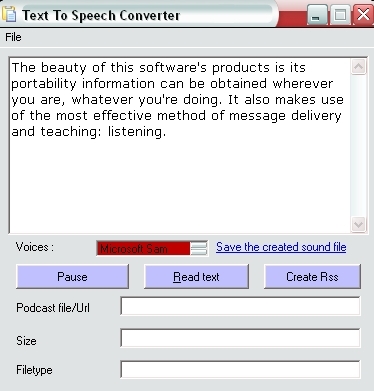 The Text To Speech Converter will turn any text into an audio file at the click of a button! You know yourself that picturing something is much easier when you are listening to a description rather than reading it. - Turn your ebooks, articles and reports into audio to listen to yourself or sell to customers as an interesting and effective method of learning. - Create audio teaching packs from new course manuals for your staff, who will appreciate and benefit from the more efficient method of developing new skills and techniques. - Produce podcasts for the upcoming boom in iPod technology before other companies in your niche with the built-in Podcast Creator! This will give you first access to thousands of potential new customers! - Use the software to issue reports and memos to staff, new product descriptions to customers, provide professional updates for company meetings, and even news or promotional information to post on your website or business blog! The beauty of this software's products is its portability information can be obtained wherever you are, whatever you're doing. It also makes use of the most effective method of message delivery and teaching: listening.